FORT LEONARD WOOD, Mo. 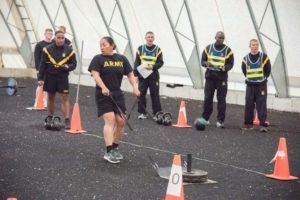 (April 4, 2019) – The Army Combat Fitness Test isn’t scheduled to become the new fitness test of record until October of 2020, but Fort Leonard Wood’s 1st Engineer Brigade is already prepping for the change by ensuring their drill sergeants and unit leaders receive ACFT certification training. On March 28 and 29, certified instructors within the brigade held the second iteration of the level I and II courses. Staff Sgt. Travis Linden, Company D, 554th Engineer Battalion senior drill sergeant and ACFT Level III certified instructor, said he hopes to hold the two-day certification training twice a month. Linden, who was already a certified Master Fitness Trainer, attended a three-day course held at the Army Physical Fitness School at Fort Jackson, South Carolina, in order to obtain the level III certification needed to teach. “Right now it’s very new to everyone and (the Army) wants everyone to be trained to a standard instead of just reading the book and interpreting something different,” he said. According to Linden, those with the level I certification are able to grade the ACFT. Those with level II may grade the test, serve as an officer in charge or noncommissioned officer in charge and instruct level I.
Sgt. 1st Class Nathan Gulley, Company A, 554th Engineer Battalion drill sergeant, said the way the Army’s guidance is currently written for conducting the ACFT makes it easy to understand. He added that he is interested in obtaining the level III certification if given the chance. In addition to providing training to those who will be running the tests, the brigade’s Company D, 554th Engineer Battalion, has begun familiarizing their Advanced Individual Training Soldiers with the ACFT test to ensure they have a good understanding of it. “We just want them to see what the exercises are and maybe give them a chance to try some exercises,” Company D Commander Capt. Eric Anderson said. For those unsure of how to prepare for the ACFT, Linden recommends sticking to the Army’s Physical Readiness Training. 1st Engineer Brigade Soldiers participate in Army Combat Readiness Level I and II certification training March 29. Photo by Dawn Arden.